Welcome to our metals guide! Let's talk about the best wedding ring metals for your lifestyle and aesthetic. You’ll also learn how to take care of your wedding rings so they stay beautiful. Precious metals are at the heart of what we do. We love the sunny gleam of yellow gold, the wintry soft shine of white gold and platinum, and the flush of rose gold. We love them together, and on their own. All are beautiful, and suitable for a lifetime of everyday wear. Once you’ve decided on the ring of your dreams, there comes the question of which metal you want. All wedding rings at Catbird come in gold and almost all of them come in platinum, which are the metals you’ll most likely want your ring made of for durability and long-lasting shine. When choosing the type of metal for your wedding ring, it’s good to think about both aesthetic and practical reasons for each metal. You may love the way 22 karat gold looks, but if you live a very active day-to-day life, this relatively-more delicate metal may not adapt to your lifestyle so well. Platinum is the toughest metal our rings come in and a great choice if you durability is your top priority. We love the sunny gleam of yellow gold, the wintry soft shine of white gold and platinum, and the flush of rose gold. The gold used in all jewelry is an alloy — meaning other metals are present for additional strength and to sway the color in a bit of a different direction. In a nutshell, 14k is 58.5% percent pure gold, 18k is 75% pure gold, and 22k is 91.75% pure gold. Our 14k yellow gold is comprised of 58.50% yellow gold, 31.25% copper, 5.25% zinc, and 5% silver. Our 18k yellow gold is made of 75.50% yellow gold, 12% silver, 11.25% copper, and 1.25% zinc. Our 22k yellow gold is made up of 91.75% yellow gold, 5.25% silver, and 3% copper. Our 14k white gold is made of 58.50% yellow gold, 23% copper, 9.50% nickel, and 9% zinc. Our 18k white gold contains 75.50% yellow gold, 14.50 copper, 5.75% nickel, 3.50% zinc, and 0.75% silver. Our 14k rose gold is comprised of 58.50% yellow gold, 39.50% copper, and 1% each of zinc and silver. Our 18k rose gold has 75.50% yellow gold, 22.25% copper, 1.25% zinc, and 1% silver. Platinum is one of the toughest of all metals. If you work with your hands a lot you may want to consider platinum. Its density allows it to withstand scratches well (though all metals will eventually scratch with normal wear) and it’s one of the only metals that doesn’t have “memory.” This means that once platinum is shaped into place, it stays like that. Platinum is also considered a real white metal, which means that the color will not fade, but will develop a patina (a soft satin glow) over years. This patina is revered in Japan as a metaphor for a long-lasting relationship of love, making it a popular metal choice there. Since it’s a pure metal, platinum costs more than gold, but it can be worth it for those who want a strong and hearty metal. Since platinum is pure, it’s hypoallergenic. 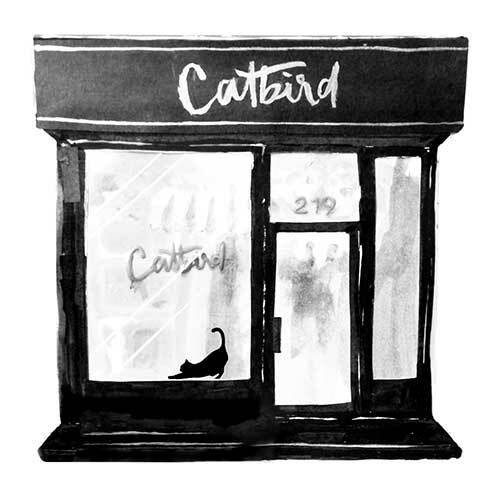 All Catbird engagement rings and wedding bands come in platinum. Yellow gold is perhaps the most traditional choice of metals. We offer yellow gold rings in 14k, 18k, and even 22k; the higher the karat, the softer and brighter the gold. While 22k yellow gold is softer, it’s still durable enough for everyday wear, especially if you are comfortable with the idea that your ring will show some age over time (in a way that we think is absolutely beautiful). All of the yellow gold engagement rings designed by Catbird use 14k gold. One of our standout designers, Prounis, works exclusively in 22k gold, which gives the gold a luxurious air of antiquity. One of our most popular engagement rings set in 14k yellow gold is Odette the Swan. White gold is a beautiful, popular choice for engagement and wedding bands and highlights diamonds wonderfully. All Catbird engagement rings and wedding bands made with white gold are made with 14k gold. Some of our most popular rings set in white gold are Serena the Swan and the Constellation Ring from Hortense. If you’re looking for a ring with more of a vintage feel, rose gold is a lovely choice. We love its romantic and delicate pink tone. Rose gold is also more durable than both yellow and white gold, thanks to the copper addition. However, rose gold is not advised for those who have any allergic reactions to copper. All Catbird engagement rings are made with 14k rose gold. Our most popular rose gold ring is Odile the Swan. Gold and platinum are both sturdy metals that can withstand a lot. That being said, each metal will lose a bit of its shine through the years. To bring back its luster, simply mix a small amount of mild dish detergent with warm water in a bowl. Put the jewelry into the bowl and let sit for a few minutes. You can also use a baby toothbrush to very gently scrub the jewelry. Remove the jewelry from the soapy water, rinse it and dry thoroughly with a soft polishing cloth. Gold - especially in karats lower than 22k - can have a tarnishing reaction with some people’s skin over time but a polishing cloth will do the trick. Another great investment is a personal ultrasonic cleaner to keep your beauties extra shiny all the time. We also sell our Signature Sparkle and Shine Kit, which comes with the Shine On Stick, a cleansing solution pen to get into all the little crannies of your rings and spruce it up, and the Shine On Polishing Cloth to provide overall shininess. It’s super easy to use (and is included with any purchases over $1000).